2018 Update: We still stand by this discussion of whether scarves are professional enough for conferences — but you may also want to check out our more recent discussion of how to wear scarves to work. Maybe this is a cultural issue, but I’d never, ever, wear a scarf to a conference. Ever. At the office, sure, if there’s no meetings. At a conference, however, there is no more surefire way to be treated like a hostess/secretary/admin than wearing a scarf. The women who actually have those jobs are all colour-coordinated, but that doesn’t help. All people see is scarf or no scarf. I think it’s a real shame, as I like scarves and the femininity they bring to an outfit. Instead, I’ve settled for statement jackets, or a skirt or shoes that “pop”. Is this because I’m in a (very) male dominated business, or is it a Europe/US thing? The next person who comes to mind when I think of scarves is an intern I worked with a few years ago, who often accessorized a simple long-sleeved t-shirt or sweater with a scarf wrapped loosely around her neck, almost like a cowl (as pictured in the blue/black picture above — that’s the DvF Hanovar Scarf, available for $165 at ShopBop.) It always struck me as a professional, put-together look. The ONLY scarf look that I can think of that has negative connotations — for me at least — is the “flight attendant/50s schoolgirl” look: a scarf tied once, tightly around the neck, with the ends left out (as in picture #3 above. Gorgeous scarf, though: it’s the Pucci Swirl Silk Scarf, available at Ventee-Privee for $89 (was $250); click here for an invite if you’re not a member.) I’m sure I’ve seen women pull it off in a stylish way, but I feel like it’s a hard look to make modern unless you also have the benefit of being French. Now — maybe what reader A is getting at is that a scarf is a more feminine look. But both of the women I mention above (the partner and the intern) wore very simple pants. In fact it’s almost hard for me to imagine how something as simple as a scarf could be seen as “so feminine that obviously she’s the hostess.” Pink glitter platform heels, sure. A mini-skirt, sure. Even big tacky jewelry (a la Melanie Griffith’s “before” in Working Girl) — sure. But a scarf? Some social media images (flight attendant) via Deposit Photos / ViewStock. Readers, what do you associate with scarves? What is your favorite way to wear them for work? In general, what do you wear for a conference in a male-dominated profession? I work in the US diplomatic community and it’s a bit of joke that ALL the female ambassadors — and the women gunning for promotion to ambassador — seem to wear scarves. The scarves are lovely, rich, silk scarves, worn knotted loosely in front, or tucked into the neckline of jackets. These are powerful, accomplished women who can hold their own in any environment. I doubt they would be wearing scarves if they didn’t read well both in our culture and in others. Nancy Pelosi, Hilary Clinton, Elizabeth Dole, Johnetta Cole, Donna Shalala, and Marion Wright Edelman and found…not many scarves (a few on Pelosi, but she seemed more inclined to statement necklaces, if she wore any accessories in her collar region). Exception: Dr. Edelman, whose photos showed either scarves or multicolored, multi-textured, large-beaded necklaces. Marissa Mayer? No scarves. Sheryl Sandberg? Ditto. Katie Couric? Almost no scarves. Next I checked Google images for the 2013 meetings of ACS (American Chemical Society), SWE (society of women engineers), and ABA: two scarves at ABA, suits only at ABA, biz casual at the other two. My sample could surely be improved–more conservatives? business execs? etc?–but I gotta go back to work now. Given your examples of scarf wearers vs. non-wearers, this sounds like it’s generational. I love this scientific approach to it. After a debate on black tights in winter, I walked to work counting black tights versus bare legs. Not re: whether professional or not, but scarves are the one thing that I buy and then NEVER WEAR. Except for winter scarves worn with parkas. I just can’t figure out how to make them look nice. Ditto. And I find that people give them to me as gifts quite often, and they usually just sit there collecting dust. I like infinity scarves for just that reason. Wrap them around once or twice and they work. They also won’t slip off my neck that way. I almost always wear a scarf in my office or at conference because I am inevitably freezing in overly air conditioned spaces. I’m typically in business casual environments and have never thought scarves looked unprofessional. However I can see how some scarves may be t0o casual to be worn with a suit. I also work in a male-dominated industry but I don’t mind looking “too feminine” since I’m not about to dress like one of the boys. No offense to the older male engineers I’ve worked with but I’d rather not take fashion cues from most of them! Hahahaha could not stop laughing at that! I too work in a male dominated field (electrical engineer) and I never hesitate to wear scarves, or dress feminine for that matter. The only way I can think of wearing a scarf that might connote admin is if it’s tied around your neck 50’s style. My husband is in commercial real estate, and he can spot a residential real estate agent from a mile away. The giveaway?? A scarf, and a brooch. I don’t wear scarves (small law firm partner here). I like the look of scarves, but don’t know how to wear them. 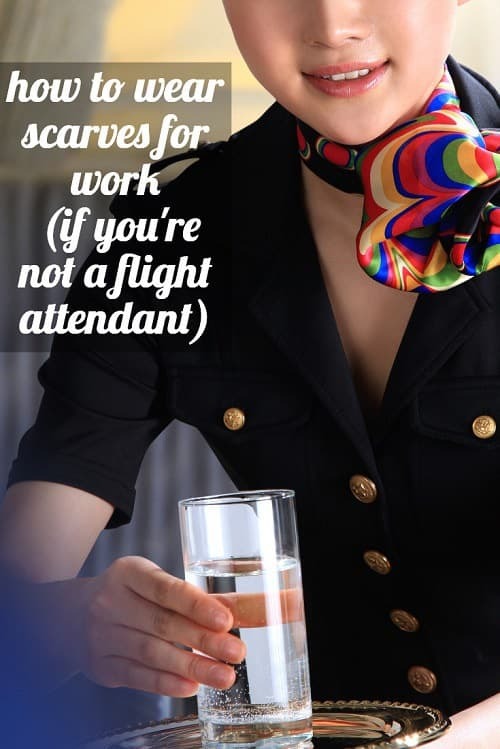 I think the small silk (“flight attendant”) scarves are professional while the long (“cowl”) ones are casual. Biglaw here and I wear scarves a lot. Never occurred to me that someone would think flight attendant. Not particularly worried about that. I wear a lot of pretty conservative pant suits, so to me, scarves are a good way to add some color and personality without seeming frou-frou. Scarves are great, and very feminine if worn right. They also are professional if worn right. I recommend to all. I think there is a huge difference between a high-quality (not necessarily designer) silk scarf, and a textured, “crafty”-looking scarf. The former is much more professional. I do think, however, that if the admins/staff/hostesses at a conference are wearing some sort of color coordinated look that includes a scarf, it’s best to not wear one so you aren’t mistaken for a staffer when you’re not. I have a flight attendant scarf that I have now deemed to be a tie-on-handles-of-shopper-style-bag scarf. So, it is casual to me. It might be a scarf for a shirt with a small neck opening again, but I haven’t tried that in ages. I think that scarves are awesome, but also a good way to waste a lot of time getting ready in the morning. I have a Hermes one that was my paying-off-law-school present to myself. I like to think that I’ll pass it down to one of my daughters some day (so do I need another to even it out — two daughters, one scarf). I think it all depends on the quality of the scarf and the design. A beautiful scarf can add a memorable pop to a conservative outfit and can definitely appear professional. I would stay away from the cheap, polyester ones though – those read more admin or flight attendant. I really like your blog. It looks like you just started, so good luck. I’m curious to see what you post next! I’m just as confused as everyone else here. Scarves not professional? Huh? I don’t wear scarves because I like to play with them and I worry they’ll be a distraction (same reason I avoid click-y pens). But I do bring along a scarf/large wrap to conferences or large meetings where rooms tend to be air conditioned to 55F. I usually wear it around my neck (if I’m near a vent) or on my lap. I do this too. I generally keep a pashmina overthe back of my desk chair to wrap up in if it gets chilly (a draped or cowl look like in picture 1 and 2). It would never occur to me to wear a scarf with a suit or as part of an outfit in a business casual office – I’d only wear it to keep warm in that environment. I love scarves for dressing up casual relaxed outfits though. They can be so comfy and cosy as well as pretty (big scarves you can wrap around a couple of times), and I used to wear them to work when I worked in an office with a casual dress code. Ever since reading this thread all I have been seeing is women rocking scarves and looking professional and stylish doing it. I guess I’m just more aware of it now! There are some nice looking pen holders on Etsy. I wonder if this issue is more specific to the question-asker’s particularly company/industry/environment – I’ve worked in several different law offices, and often, there are certain items that are worn frequently and widely by the support staff (in one office, it was Coach bags; in another, it was twin-sets). Those items then tended to get associated with the support staff, and the female (attorneys, in my case, or I guess executives in a non-law office) would avoid those items for that reason, even though there’s nothing inherently “unprofessional” or “wrong” about carrying a Coach bag to work or wearing a twin-set in a business casual environment. I think that’s a likely explanation for this reader’s issue. If that’s the case then she shouldn’t wear them. I work someplace where the Coach bag is a support staff flag. A very high quality silk scarf has always been analogous to a high quality man’s tie in my mind. But I tend to only notice the women who look powerful and professional, not the one that look cheap or frumpy. I don’t wear my scarves very much anymore since menopause wants to make them feel like I am in an oven when I do, but when I did one of my favorite ways to wear them was tied in a loose Windsor or 4-in hand knot. Tying scarves as a man’s tie is one of my shortcuts for putting them on quickly, and professionally, in the morning. Just a point of interest – in the UK it’s quite common for women to know how to tie men’s ties since ties form part of the standard school uniform – I had to wear one from the age of 4 to 11 (my secondary school had revere collar blouses instead). So I’ll definitely try that! My tip for making scarves not fall off is to tie the pointy ends together when a square or rectangle scarf is folded into a triangle, and then you can wear it like an infinity scarf. Scarves are a wonderful alternative to jewelry. I love that scarves add color and punch and no noise. (yes Bubble Necklace – I’m looking at you). I agree with other commenter that quality silk scarves are a whole other thing from the crafty/gauzey/cotton kind. Click on videos down the right side. Why did I never think of wearing a scarf as a bracelet?? I think both look 1 and 2 are a bit too casual because the scarves are large. I think that would work better with a smaller scarf. As shown, it’s the type of thing I tend to do when heading out somewhere after work to give what I’m wearing a bit more personality. Look 3 seems fine to me, although not quite my style, the only thing about it that seems remotely “flight attendant” is the short sleeved shirt. I love scarves and wear them frequently. Sometimes in lieu of a belt, sometimes around my neck, sometimes tied around the handles of my handbag. I have to say that I saw a woman on the DC metro yesterday wearing a cobalt blue dress, and a blue/green patterned scarf and she looked so darn chic. I think she was european. How timely! I love scarves on weekends and have been thinking about investing in more silk scarves for work because I am newly pregnant and thought they could be a good accessory to mix up solid color maternity work dresses (and draw the eye away from the bump). Ditto on the quality comments. Any fabric you would see on a men’s tie is a fine female professional accessory IMO. But then again, if you are color coordinated and you tie it right (so it looks purposeful not something you threw over your neck on your way out the door), a cotton/linen scarf can also look very professional. I have a couple of thoughts on scarves, who wears them, and what they may symbolize to some people. Straight out of college, i could not figure out scarves, so they sat. I eventually learned more about how to wear them, however, I wear them on more sedate days at work, and carry a few safety pins to assure that things stay in place. For that reason, I’m wondering if it’s significant for women who are on television to wear them less, because it’s one less thing to fiddle with, and with the portable microphones, they may be better for non-broadcast days. Scarves can sometimes pull on identity – such as ethnic, religious, or even artistic beliefs, so unless it fails the “I look professional and pulled together for my work” scan – it gets a pass from me. And there seems to be an edge to the letter of – if-I-look-feminine-it-is-frowned-upon, and well, I hope that isn’t where the writer really is, because isn’t the point of having a decent climb up the ladder being able to enjoy your own style? There seems to be a hint of the feeling I had when i graduated from shoe freedom through eighth grade to seeing adult-sized saddle shoes for the first time, realizing they were required for the next 4 years. You make peace with some of these items of clothing, because it’s more about perspective. I’m a junior associate at a big law firm–I realized that I was hired to be more of a general corporate transactional attorney, but I find myself being drawn to M&A work (and realize that I LOVE the work–which I know, I know makes me sort of insane by definition). The problem? My firm doesn’t have enough M&A work to sustain an M&A specialty (and I doubt many firms in my medium sized midwestern firm would either). Thoughts on what I should do? Should I start applying to other firms with a more robust M&A practice? How would I even know which firms have a big M&A practice? I know I’ve brought up this point here before, but I find the assumption the assumption that something that is associated with women/more feminine is automatically more unprofessional extremely bothersome. I realize that we live in a world where feminine characteristics ARE currently considered less professional, but I just feel like we shouldn’t so easily buy into that. There is nothing inherently unprofessional etc. about a wearing a scarf — we only we ascribe this meaning to scarves because they are traditionally associated with women, and men (and their attire) are traditionally are the baseline for professionalism. There cannot be gender equality if the markers for professionalism/success are always within a male framework. If women have to become more like men to be accepted in the workplace and succeed, it is not true success. Rather, our perspectives should change so that traditionally female behaviors are just as respected as traditionally male behaviors. If we continue to perpetuate the idea that traditionally male behavior is more professional, then women will continually be at a disadvantage in the workplace simply by virtue of being women. Women shouldn’t have to be more like men to be adequately professional; rather, the definition of professionalism should change to include more feminine characteristics. I realize that we need to pick and choose our battles etc. and that this obviously isn’t the most important issue facing women, but I just feel like Corporette (which, for the record, is a blog is generally really like) continually offers ways to be considered more professional by basically being less feminine. I find this frustrating and feel it works against women’s progress in the workplace. Just want to add that I realize that scarves may not be professional because they’re too casual or distracting. I take issue with the assertion that they may be unprofessional due to the fact that they’re overly feminine and/or if they are worn should only be worn with masculine-ish accessories to make sure the wearer doesn’t seem overly feminine. I also want to to point out that I realize that a lot of traditionally female attire is/was actually designed to further sexualize women and/or limit their mobility — for example, high heels lengthen the leg and accentuate the behind in a visually appealing manner while also limiting women’s speed and oftentimes causing pain(or at least more pain than most men’s shoes) — so defending traditionally female ways of dressing can also be defending “tools of the patriarchy” (if you will) thus be a shaky argument. However, I don’t feel like scarves fall into that category. . . The best dressed scarf wearers I have ever seen have been in Paris. The scarf never looks “over done.” I think scarfs do lend a certain gravitas and never look quite right on a 20 something. Love her. She is so elegant. I’d also recommend the MaiTai’s Picture Book blog. Fantastic. I have a couple Hermes scarves and picked up one of my favorite ways to wear it from a video on her site (the Friendship knot). Looks very complicated but isn’t. Ooh, thanks for the recommendation! I was familiar with Wendy’s Lookbook and Une Femme, but this is a great additional resource. Click forward to Image #9 for commentary on her use of scarves, and a picture of her in a bright pink one talking with a few suited male colleagues. I’m European myself, and in my experience, I did not encounter such a thing at my workplace or in any law firms I’ve interned. I cannot say many women wore scarves during conferences or meetings with clients, but I have seen some, including senior partners of biglaw firms. I don’t remember young women doing this, though I have to admit I haver never paid much attention to this – so it could be either this is a generational thing like the collar in collar out, or it could be one would not think about professionalism of a female based on her clothing when she is in a higher position as long as her clothes aren’t completely out of line. I love scarves and wear one almsot every day. If I wear a blouse or shirt that has some interest, no scarf but always a scarf with a tailored shirt and jacket. I have been collecting them for years. A silk square looks professional, I think. A great blog about scarves is Mai Tai’s Picture Book…beautiful pictures of a stylish French woman who has an amazing collection of Hermes scarves, bags and jewelry, plus scarf tying ideas. Count me as another of the surprised. I’ve always been a scarf fan, from my 20s onward, even the ’50s flight attendant kind :) For scientific purposes, I should point out that my work settings have been: professional office, newsroom, nonprofit, creative agency. And a resounding second to the suggestions to get scarf advice from the Wendy’s Lookbook video and the fabulous Une Femme, two of my favorite style bloggers. Great topic! I’m going to deliver a keynote speach in a few weeks in a male dominated seminar and deciding what to wear is difficult. Personally I have ruled out scarves as I think I need a little more edgyness rather than softness which I feel scarves bring. Thinking of wearing a basic but powerful dress, tights, heels and a smart jacket. No nonsense outfit but womanly. I work in academia and never considered a scarf unprofessional, unless it was a chunky knit that looked homemade or they got it in the juniors’ section. The funny thing to me is, in my industry, if you want to get mistaken for an admin assistant – wear your schloppiest clothes and ugliest shoes. Sad, but true. It’s like the admin assistant uniform is cropped cargos and an old polo. From a male perspective, I’ve never once considered a scarf to be unprofessional. I actually think it takes quite a bit of savvy and skill to pull of a scarf – lord knows most guys couldn’t do it, myself included.